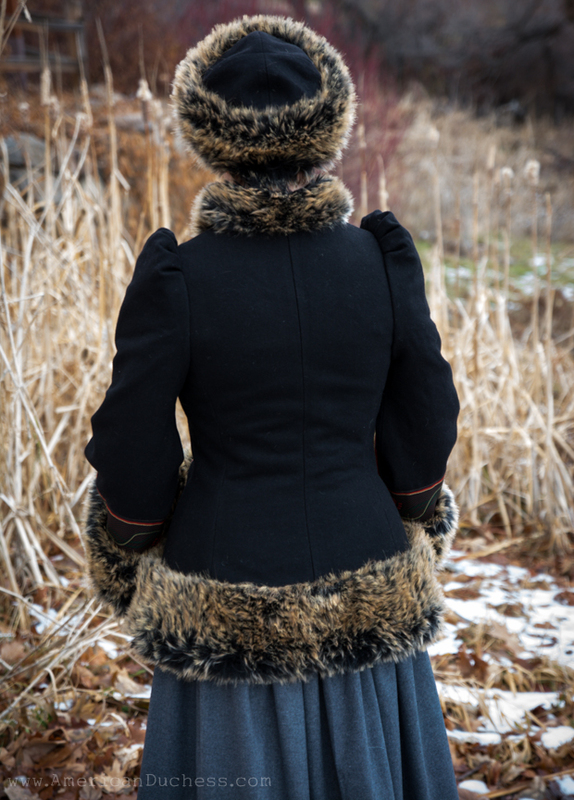 Last week I shared with you the beautiful "Russian Seasons" coat from Armstreet.com, paired with an 1880s wool skirt I threw together for the occasion. The skirt was made from my favorite Truly Victorian pattern, one I've used over and over again - TV261 1885 Four Gore Underskirt. In all of the original pattern books I have, this simple skirt design plays a role in a great many of the outfits. 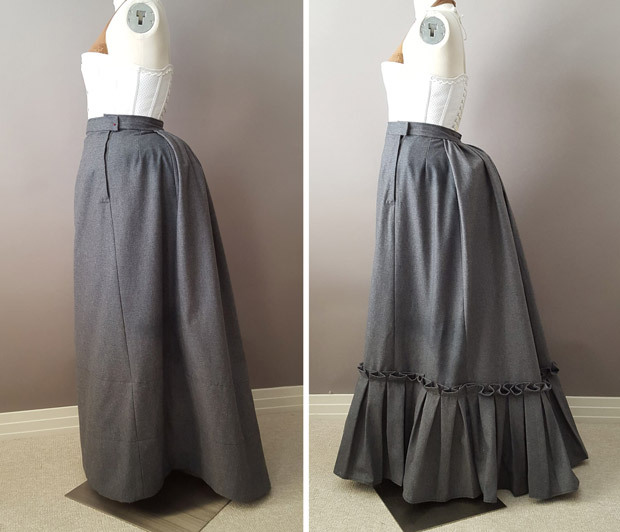 Initially I thought a plain skirt best, but once I had it made I felt it was too plain, so I added the box pleated ruffle. Ruffles are time consuming and take up loads of fabric (I'll have to go back to the fabric store for more of this wool if I want to make an apron for a full three piece ensemble), but the effect is quite grand. I'm glad I added it. The skirt without the ruffle and with. 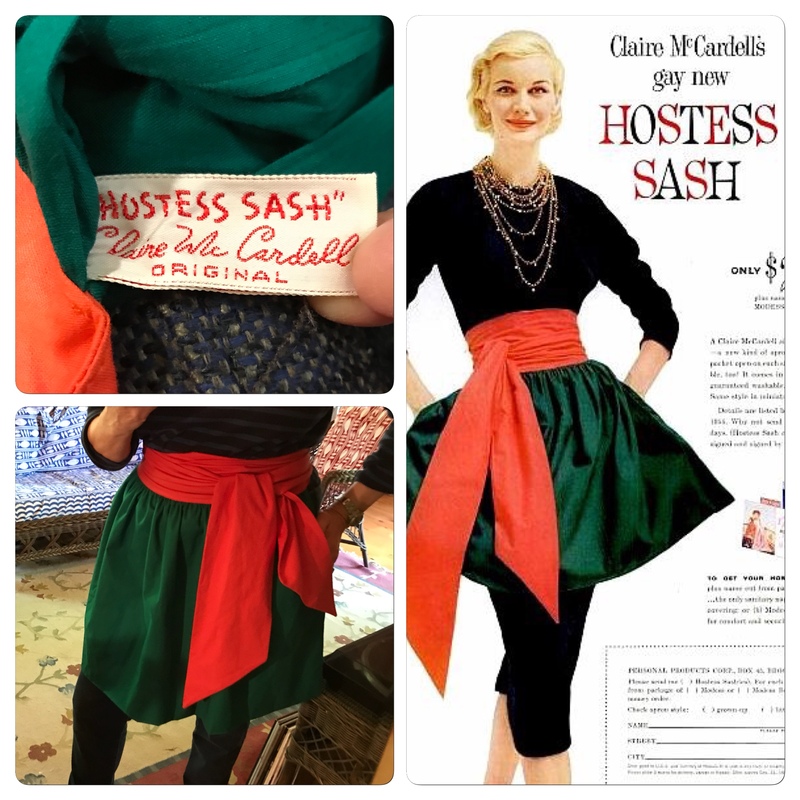 For particulars, the skirt is faced in organza about 15 inches wide at the bottom, and then faced again in cotton flannel about 8 inches wide. This was a note from Directoire Revival Fashions 1888-1889 by Frances Grimble , and I do recommend doing some kind of hem facing, to give the skirt weight and durability at the hem, and also keep it from tucking in between your feet as you walk. I started with another Truly Victorian pattern, TV420, but this bodice is from 1879 rather than the mid 1880s, and quite a lot of bustle happened in those years. 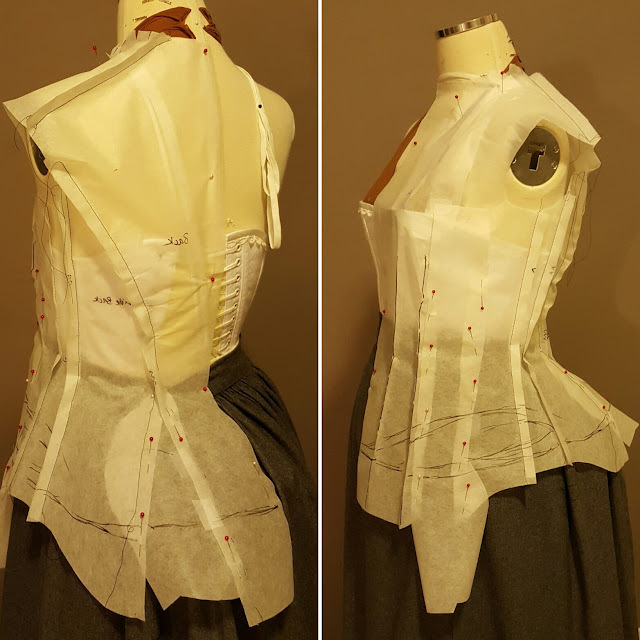 My pattern was also too small for me, so I made alterations for fitting over the bustle, and also across the bust. According to my inspiration image, I redrew the hem, and added a small box pleat at center back. Fearing I had precious little wool to complete the bodice, I added in some black velvet elements to my design, and patterned the velvet front of the bodice by creating kindof a weird-shaped princess seam merging the shape of the velvet portion with one of the waist darts. Final alterations were made to the armscye, and sleeves come later. I've now cut and flat-lined all the bodice pieces, but I don't have the 20 buttons needed to complete the CF closure, so that's it for now! 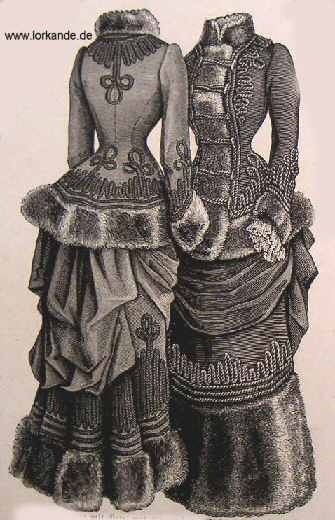 I have a slightly inexplicable love of Russian-inspired Victorian and Edwardian clothing. The cold weather rolls around and I just feel compelled to make something with a lot of braidwork or trim, something that can be paired with a round fur hat. 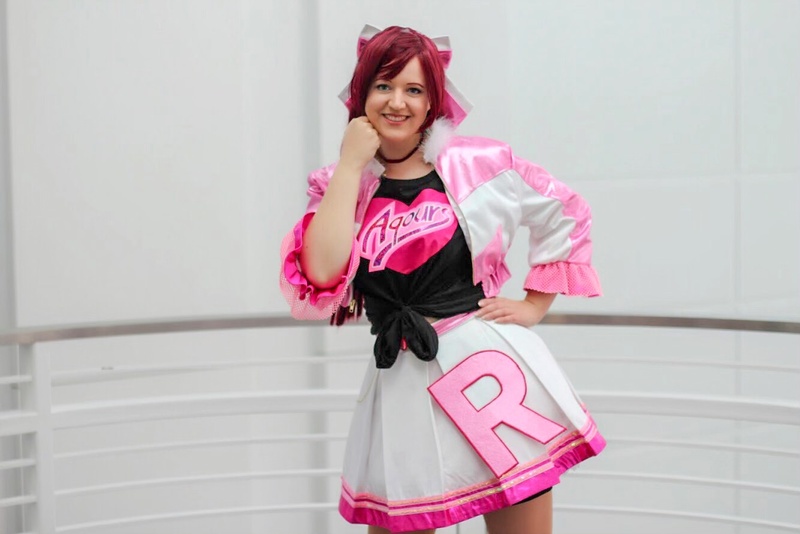 Last year I made a 19teens suit. 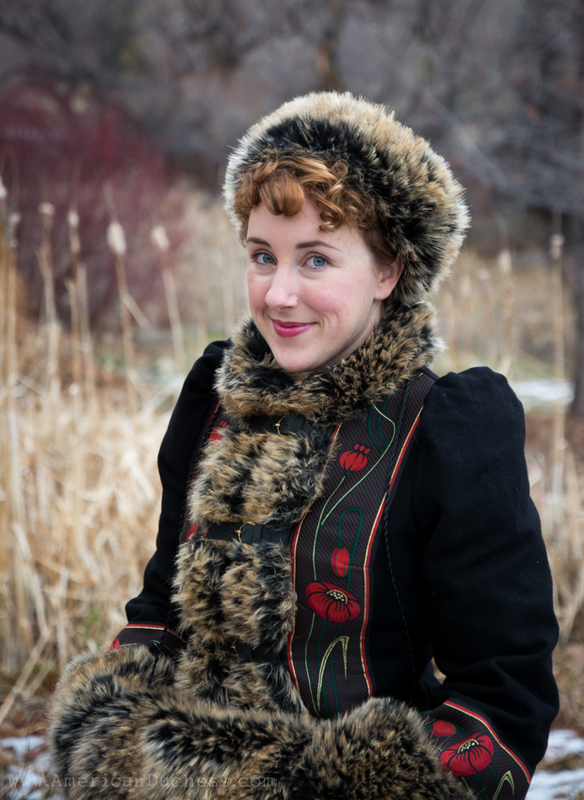 This year I was saved the trouble of tailoring a coat by this utterly fabulous "Russian Seasons" coat from a surprising source, Armstreet.com. Some of you may have heard of Armstreet before. They make medieval and fantasy armor, weapons, and costumes. 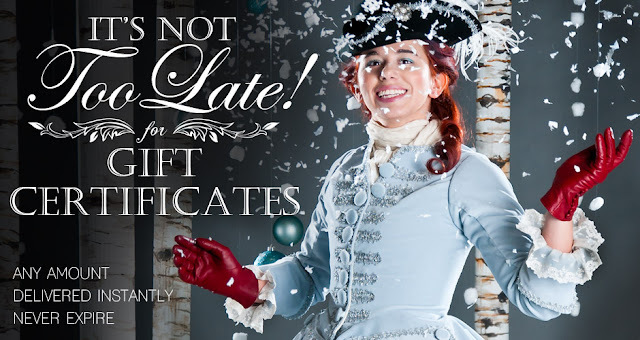 You may have switched off just then, but I urge you to check out their store, because their women's costumes are beautiful. 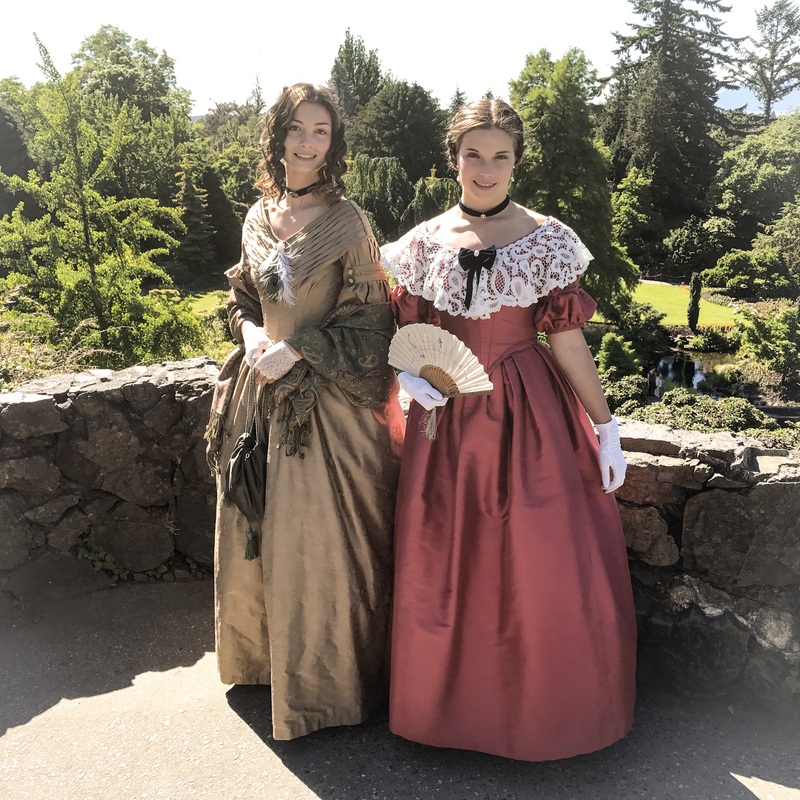 Nearly all of Armstreet's offerings are meant for LARP, Lord of the Rings, Game of Thrones, early Renaissance, maybe SCA, even adventurous modern wear, but there are a couple things in there that are actually quite lovely for later periods. But one of the most attractive things about this coat is that you can style it for so many different periods. 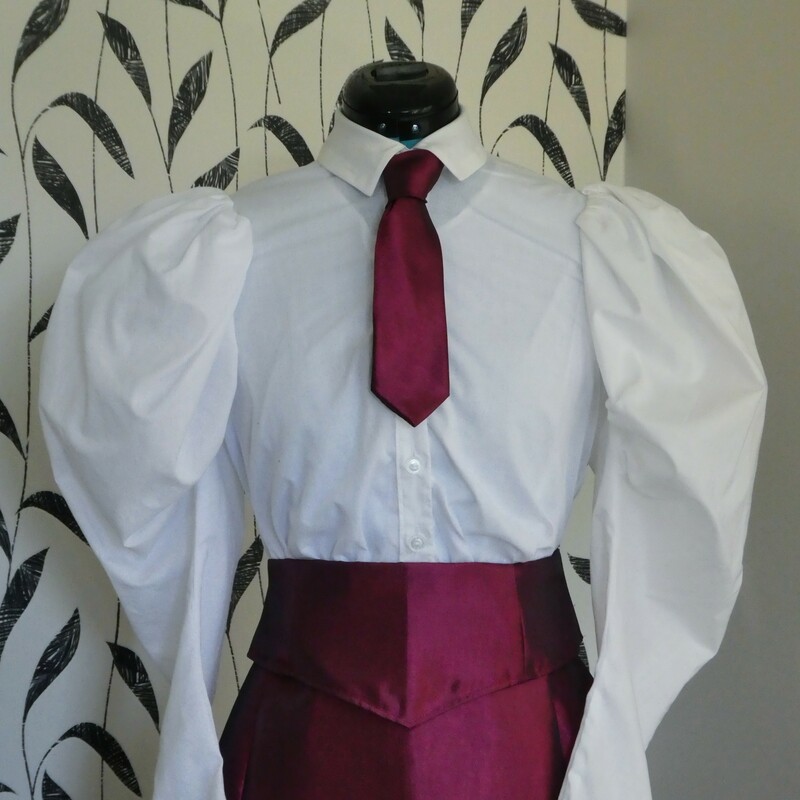 It would work with earlier 1870s, later 1890s and 1900, with 1910s and even 1920s (Miss Fisher would totally wear this! ), all just by changing the skirt silhouette. 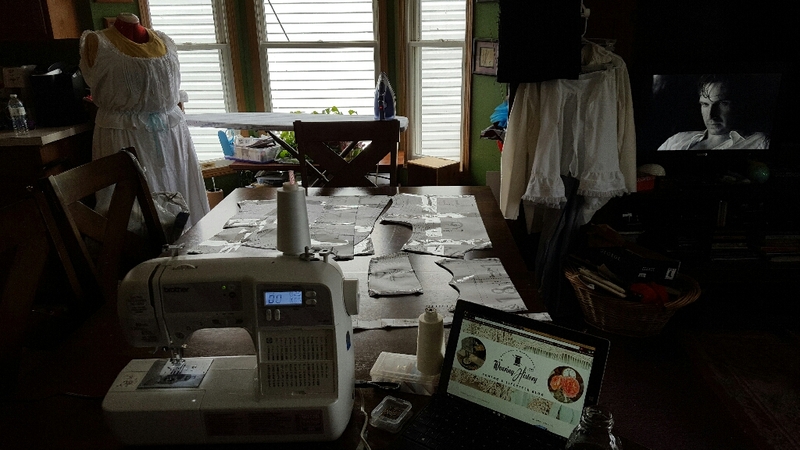 When I ordered, I punched in my measurements, and soon after got a confirmation email informing me that my coat was being cut and sewn by the seamstress. Whoa! Not just customized, actually completely custom made for me! With the measurements I gave (for modern wear over jeans, not to accommodate a bustle), I went with an earlier 1880s silhouette, more Natural Form, so the jacket would lay smoothly. You can order this jacket with any measurements, though - just give them measurements taken over your underpinnings. It took about 5 weeks for my order to be sewn and shipped from Ukraine, but it was well worth it. The coat is gorgeous and extremely well made. 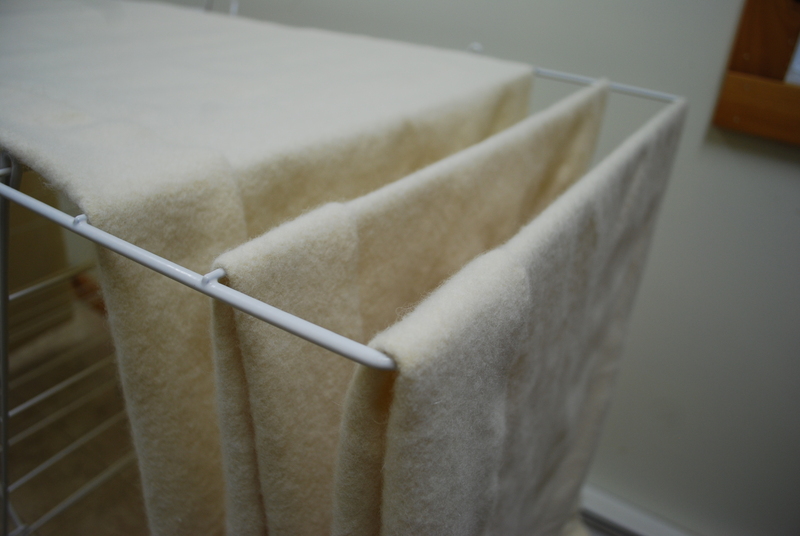 It's real wool, fully lined, perfectly fitting to my measurements, and very warm. The fur is faux, and very fluffy. I ended up trimming the fur back a bit - just my personal preference. 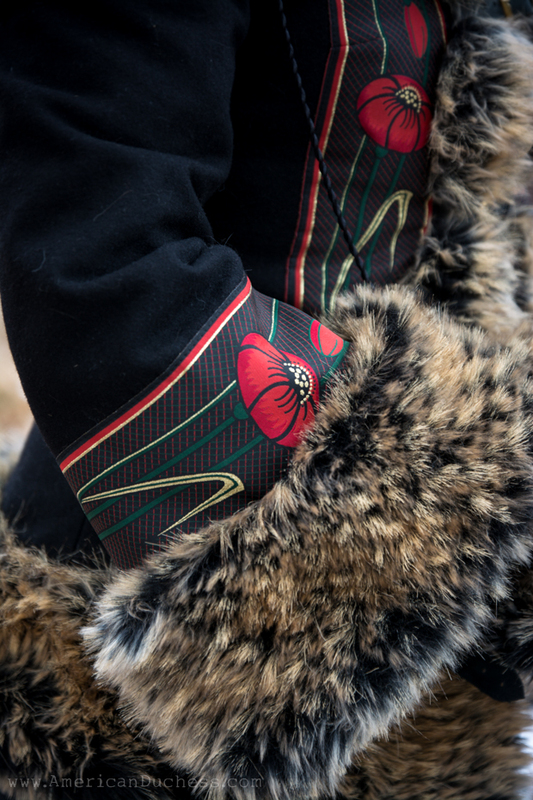 The wool, poppy trim, and faux fur are excellent quality. 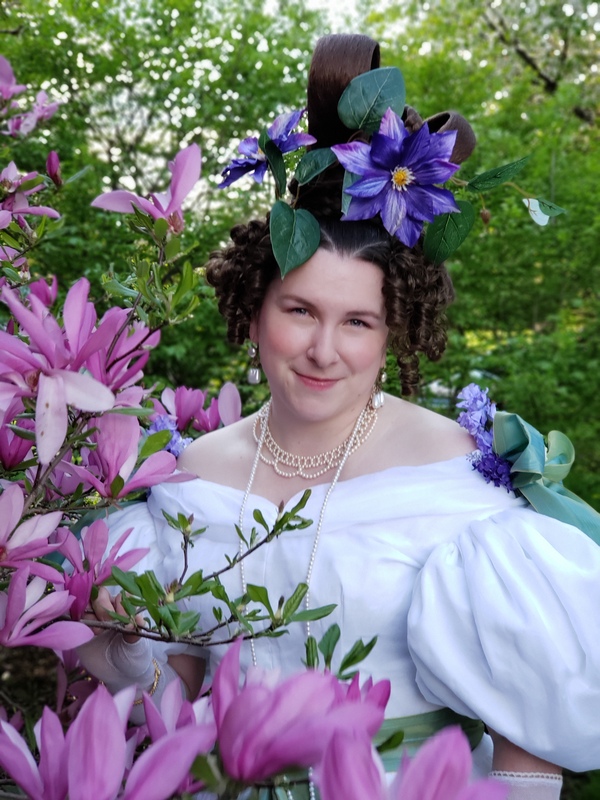 I ordered it as much for everyday winter wear as for costuming, but you could give measurements taken over your underpinnings, to use specifically for a certain costume - for instance, a smaller waist and fuller hem for wearing over a crinoline or bustle. When I got the coat, I dashed to the fabric store for some black wool to make a matching skirt, but all I could find was grey wool. 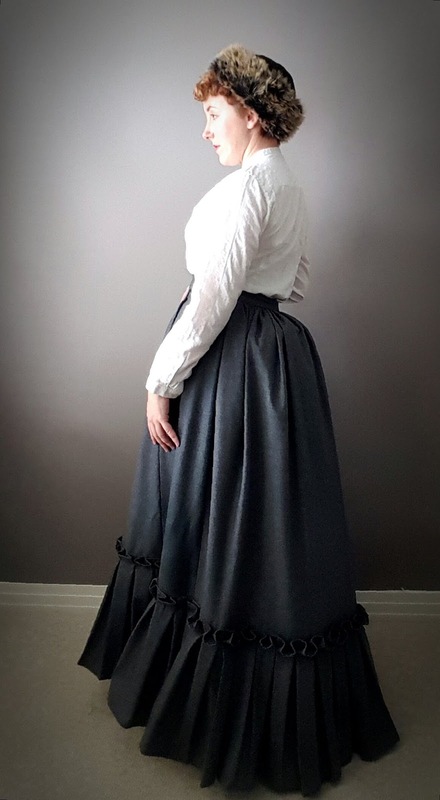 Over a weekend I threw together my favorite Truly Victorian TV261 1885 Four-Gore Underskirt to wear with the coat. It was a tough decision on which period to go with - 1880s? 1890s? 1900? 1910s? Any and all would work. I have to say this whole outfit is very warm. The temperature was about 28 degrees for these photos, but I was snug as a bug wrapped in wool and fluff. A future black wool skirt with a wide fur guard is in order, to make a completely matching outfit for ice skating or winter strolling. All in all, I love this coat, and it was well worth the price and wait time. I'm really impressed with Armstreet's quality and service, and the possibilities are broad. They're super-receptive to questions and special requests, too. 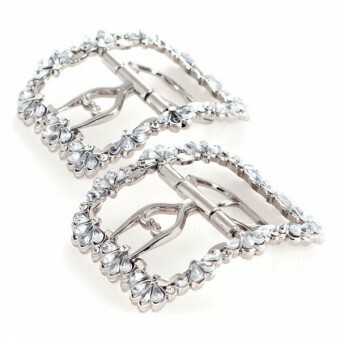 I love items you can wear for both historical and modern, so I consider this a great buy! To read more about the "Russian Seasons" coat, click here. 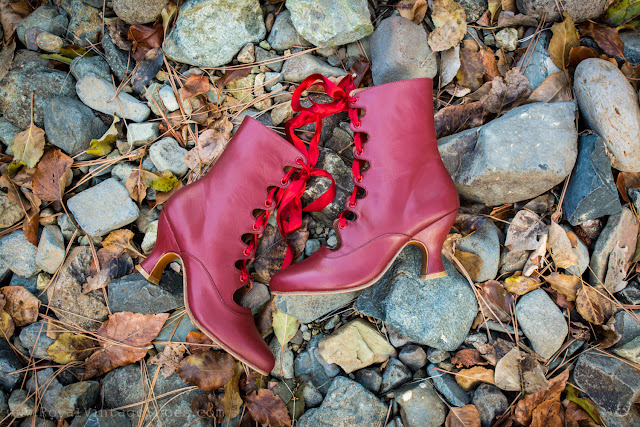 Spotlight on Tango Boots - Video! I made a video! I know that doesn't seem like a big deal in today's hugely visual world, but I worked *all day* on this and I'm proud of it, even if I simultaneously hate it because I can't stand watching myself talk. 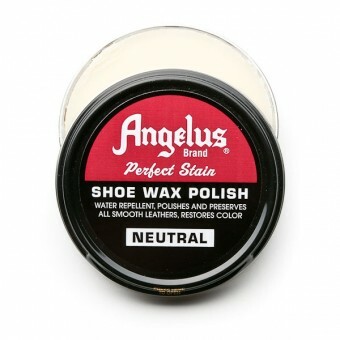 Anyway, I hope you enjoy this little insight and information on the new Tango boots. 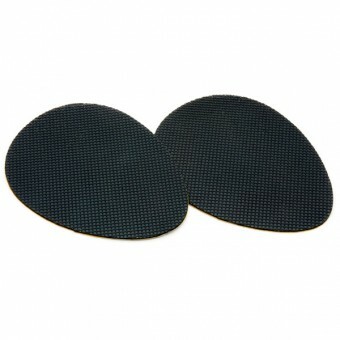 They came out wonderfully, with great quality, fit, and balance, and I hope you love them as much as I do! The Kyoto Costume Institute Book, as it's sometimes called. This is a gorgeous, enormous survey of fashion, with beautiful photographs of full costumes, from one of the most important collections in the world. I recommend this book for beginners and advanced costumers alike, as it's a constant source of inspiration and great overview of 18th - 20th century fashion. A splendid catalogue from the Victoria and Albert Museum, this book takes an in-depth look at the details of 17th and 18th century clothing, both men's and women's. Beautiful, high-resolution images reveal cuffs, collars, embroideries, trims, buttons, laces, and so on. 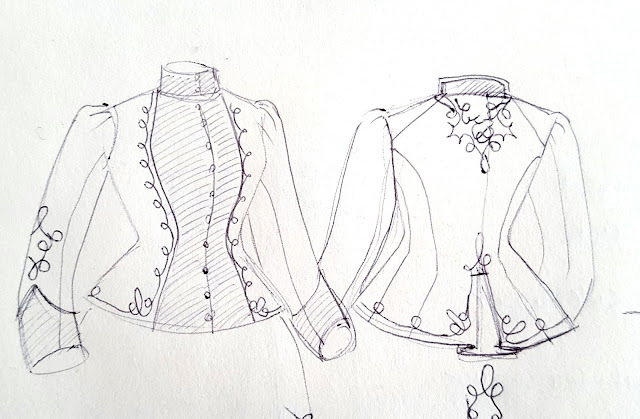 A line drawing of each garment reveals the full design, and a useful schematic for the historical costumer. The companion book to the one above, this 19th century catalogue from the Victoria and Albert Museum reveals details of men's and women's clothing from the Regency to La Belle Epoque, with close-up images of collars, cuffs, basques, buttons, and so on. Detailed line drawings show the full costume, with a description of each, and the accession numbers to assist in finding further information online. The first and largest of the "Williamsburg Books," this one is essential to the serious 18th century costumer, with invaluable information on the dress of men, women, children, and the elderly, along with purpose-made clothing, and that of the working classes as well as aristocracy. This book includes hundreds of color photographs of clothing and accessories from Colonial Williamsburg's collection. Costume-Close-Up is the companion book to What Clothes Reveal, with patterns and instructions for making many of the garments in Williamsburg's collection. This is an invaluable resource for the 18th century costumer, with patterns for men, women, and children, accessories, and with detailed diagrams showing period accurate stitching techniques. A valuable book for the Renaissance, Baroque, and Georgian costumer, Hunnisett offers a wide variety of gridded patterns, along with instructions and advice for making each. The book covers everything from closures to trimmings, as well as the creation of underpinnings. This is a practical book with good advice for theatrical costuming. I have found many of the tips in this book to be perfectly applicable to historical costuming, helping with ease of wear, and making up. Another in this series, this book has patterns for Regency through the end of the 19th century, with large and valuable sections on sleeve and bodice designs, the cuts of skirts, construction of corsets, petticoats, and cage crinolines, and how to achieve the correct look for each period. I've found this book incredibly helpful and complete in creating both day and evening looks for each decade in the 19th century. Recommended for intermediate to advanced costumers, Janet Arnold's famous books offer detailed gridded patterns, drawings, and information from original gowns in the Snowshills Wade costume collection and Victoria and Albert Museum. This book also includes a thorough preface with history and sources, along with an appendix with information on the book, author, and patterns. Second in the series, this book includes gridded patterns, drawings, and history for 1860 - 1940. Third in Janet Arnold's series, this book is perhaps the most in-depth, with patterns for both men's and women's dress of the Elizabethan and Jacobean periods, and various countries. Beautiful line drawings and thorough information complement the detailed history, photographs, and reference materials included in the preface. 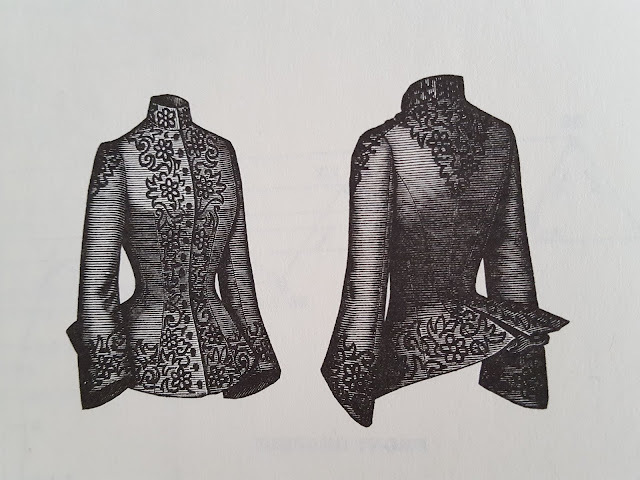 Another for the serious costumer, The Cut of Women's Clothes offers primary and secondary sources for women's clothing from the 17th c. to the 20th c. Non-gridded, scaled patterns are provided for reference or scaling up, with information on each garment. This is a rare book best acquired through a third-party vendor, but an excellent one to have. This is an excellent, focused book on underpinnings of the 17th through 20th centuries. The book contains primary and secondary sources, as well as non-gridded, scaled patterns for corsets, stays, girdles, cage crinolines, and bustles. It's a wonderful book for the seamstress interested in making her own underpinnings. A good companion to Corsets and Crinolines, Salen's book focuses specifically on corsets from the 18th century to the early 20th century, with gridded patterns ready to be scaled, showing boning and cording placement for several interesting examples from each period. This is a great book to use as-is, or as a cross-reference for corset patterns, or your own pattern draft. 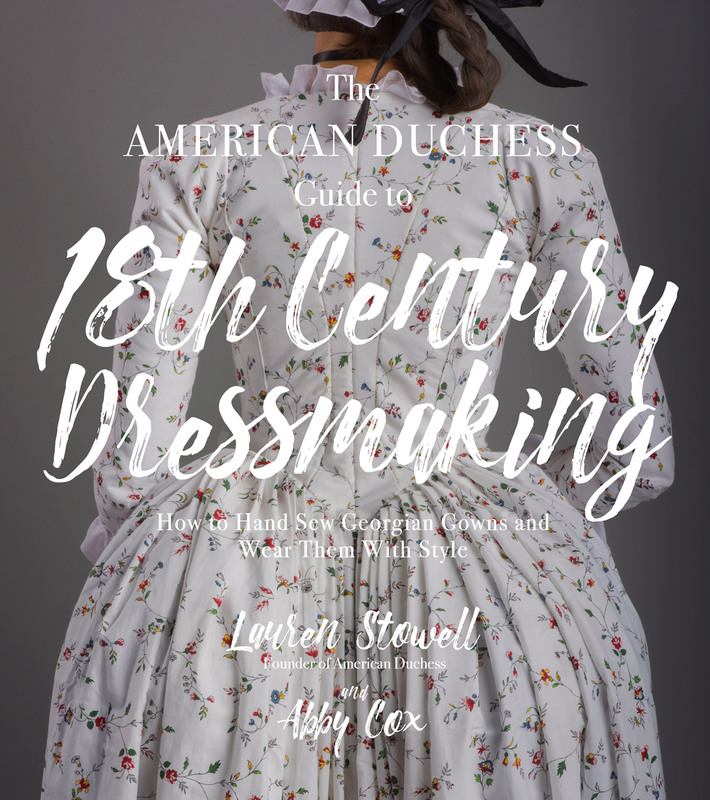 In terms of sheer volume, Costume in Detail wins, with hundreds of illustrations of women's dress from the 18th century to the 20th century. The Vogue Sewing book is a reference book for modern sewing techniques, both hand and machine. While you won't find period-specific techniques in this book, it does cover multiple methods of finishing everything from hems, collars, cuffs, and buttonholes, to how to work with faux fur, leather, and couture techniques for tailoring. 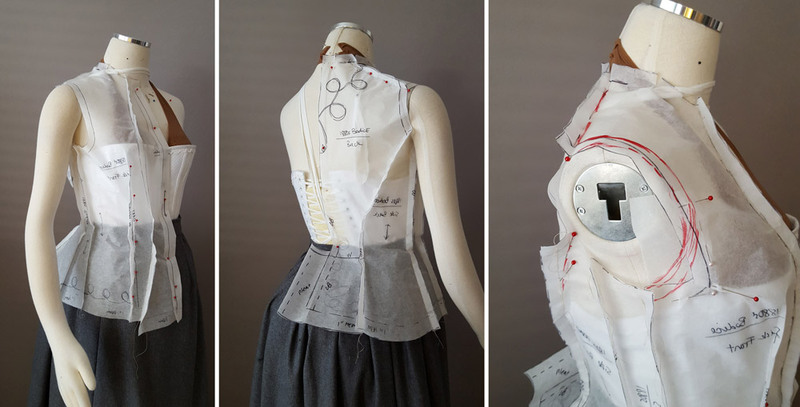 This is a *must have* for beginners and advanced seamstresses alike. Another great book for detailed, hand-finished garments, Couture Sewing offers easy-to-follow tutorials for working bound buttonholes, finishing hems, cuffs, and collars perfectly, tailoring basics, and a number of other techniques to take your garments from home-sewn to stunning. I use this book in conjunction with the Vogue Book to achieve a professional level of finish.. This is a great book for anyone recreation Renaissance fashions for either men or women. The gridded patterns are easy to use, with clear instructions on how to scale, slash/spread, and fit them. It's a beautiful book with color photographs and stunning, inspiring examples of garments made with the patterns. This is by no means an exhaustive list - there are hundreds of costume and vintage sewing books out there, covering every period you could ask for. 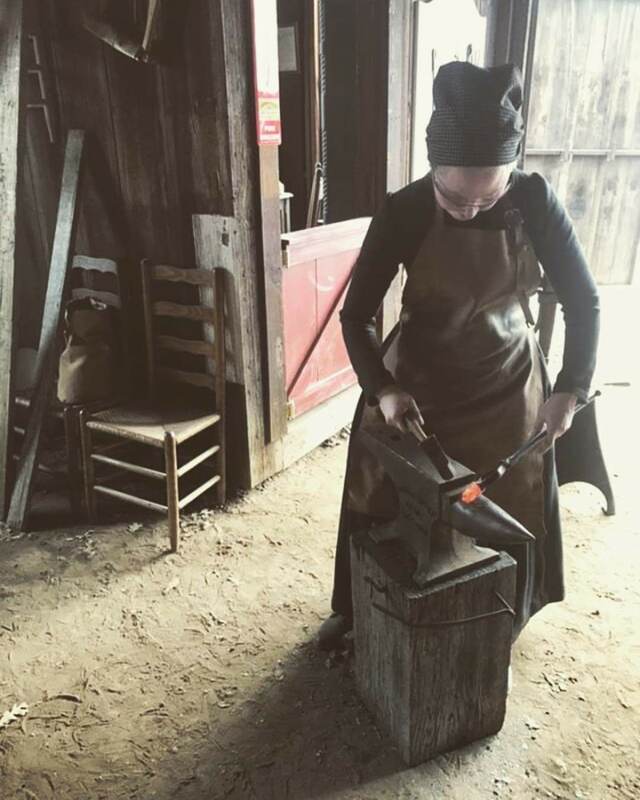 These are just a few of my favorites I keep coming back to year after year, and will hopefully be as useful and beloved of you or the historical costumer in your life as well.